The Grange Association is a volunteer supported charity based in the Grange, an area in the south of Edinburgh, supporting and protecting community interests, the environment and the local history. Formed in the summer of 1974 by the residents of an area bounded by Grange Road, Ratcliffe Terrace and Mayfield Road, Relugas Road and Kilgraston and Blackford Roads – then known as the The East Grange Association. In 1979 the area covered by the Association was enlarged to include the area to the west of Kilgraston and Blackford Roads roughly bounded by the Astley Ainslie hospital and Whitehouse Loan – The Grange Association. The objects of the founding group were to promote an interest in the character and quality of life in the area; to encourage a high standard of architecture and town planning and to react to proposals affecting the area’s development, to foster public amenity and to provide good relations in the community itself. As time has gone on the objectives of the association have become more sharply defined so that now certain members of the committee have a specific responsibility for particular areas e.g. planning matters, liaison with the Community Council, gardens etc. The Association produces a newsletter three times a year. The current edition and back numbers can be seen here. The Grange Association is partly in the area of the Grange and Prestonfield Community Council and partly the Marchmont and Sciennes Community Council. Much of the Grange is within the Grange Conservation Area. Its character is defined in the Council’s Grange Conservation Area Character Appraisal which can be found here. This document was re-written in consultation with the Grange Association in 2014. A map of the conservation area can be seen here. The conservation area is shown dark-shaded. 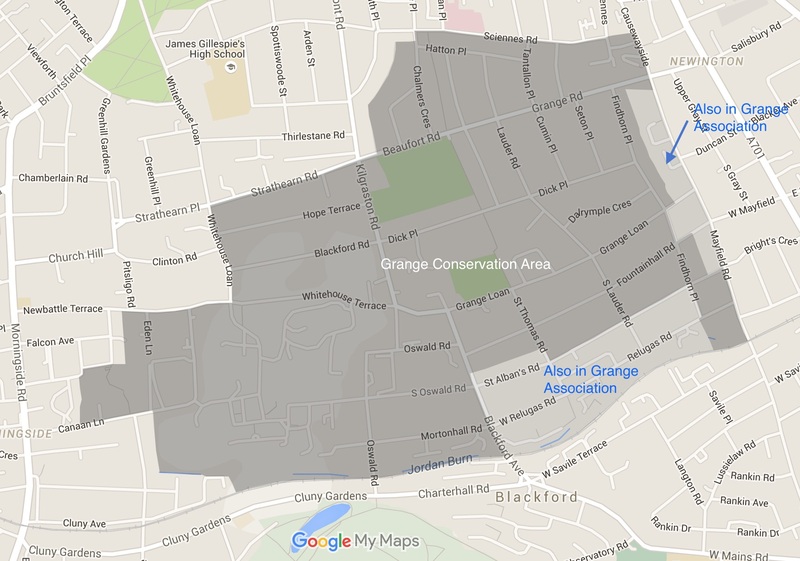 Part of the Grange Association area is outwith the conservation area and is light-shaded. The constitution of the Grange Association was last updated in 2006 and can be seen here. A list of committee members is given on the Contacts page.